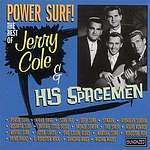 60s power-surf guitarist Jerry Cole sprayed his reverbed thunder on dozens of albums for budget labels under an army of aliases. Here are 20 maximum guitar-driven cuts: the cream of Jerry Cole's ripsnorting Capitol albums. It will help you lose that ghastly pallor in a flash, even before you leave the building, dude!